Richie Ramsay coasted to victory in the European Masters, carding a sparkling final round of 66 to secure the second Tour win of his career. The Scot picked up five birdies on the front nine at Crans-sur-Sierre in the Swiss Alps and held his nerve over the closing holes to finish 16 under par, four clear of four players in second. England's Danny Willett was among that group, finishing on 12 under par. 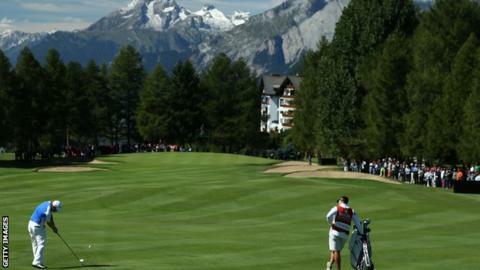 Ramsay's compatriot Paul Lawrie was eighth after a final round of 70. Lawrie, who was named in the Europe team for the Ryder Cup last week having won the Johnnie Walker Championship at Gleneagles, had looked on course to top the leaderboard heading into the final day but could not maintain his challenge. "It was always going to be difficult because Paul is a fantastic player, but my plan was just to play the golf course and pretend I was playing with my two best mates," Ramsay said. "That was my plan all week and it worked. I managed to stay patient. A few deep breaths along the stretch and holing that final putt felt so, so good. You can't buy that feeling." There was a four-way tie for second, with Marcus Fraser, Fredrik Andersson Hed, Romain Wattel and Willett four shots back. Fraser (66) birdied the first and seventh before making a strong start to the back nine registering under-par scores on 10 and 11. A bogey on 12 temporarily halted the Australian's momentum, but birdies on 14 and 17 secured a share of runners-up spot. Andersson Hed (66) produced a bogeyless round, with birdies at one, seven, 14, 15 and 17, while Wattel dropped just one shot, at five, while scoring six birdies as the top four all finished with rounds of 66. Englishman Willett (69) had an up and down day as although he dropped shots at three, 10 and 11, five birdies ensured he remained in joint second. Willett's countryman Lee Slattery produced the round of the day to finish tied for 14th; his seven under-par 64 moving him up 40 places from the end of round three and featured eagles at the first and seventh.